A bad film is enlivened by its location shooting and several music performances by Richard Hell and the Voidoids. Blank Generation, Ulli Lommel's somewhat distracted feature, filmed in the Lower East Side of New York in early 1978 (released in 1980), has been reissued on DVD. 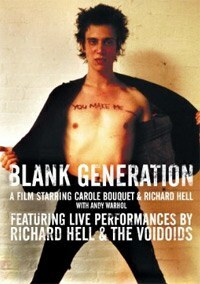 Despite many problems, the film retains some appeal due to its locations and several filmed performances featuring co-star Richard Hell and his band, The Voidoids. The story, such as it is, follows Nada Lumiere (Carole Bouquet), a French journalist who has been spending a winter in a large downtown loft and conducting interviews for French television. She has taken a lover named Billy (Richard Hell), a struggling rock musician whose band plays at CBGB while waiting for some kind of management deal. Nada and Billy make love, engage in pointless fights, and share vapid conversations. Billy's mounting frustrations with his career overwhelm him and he decides to sell off the rights to all his original material. Nada's European lover Hoffritz (Ulli Lommel) arrives unexpectedly, determined to get an interview with Andy Warhol for German television. Billy meets Lizzy (Suzanna Love), who weilds a Super-8 camera and says she's making a film based on randomly following successive strangers (a sort of proto-Slacker). Everyone becomes consumed with filming and interviewing each other except for Billy who, cheque in hand, has removed himself from the fray, although he still pines for Nada. Eventually, Andy Warhol shows up and sardonically sums up what is going on. Does it need to be said that Blank Generation is not exactly a good film? There is little continuity to the story, many scenes are awkward, dialogue is badly written, and the acting is wooden at best. It's possible, and this is alluded to by Hell in the accompanying interview, that the elliptical storytelling is more a function of Lommel's conceptualizing the film as a neo-Godardian exercise than an example of poor storytelling techniques. This tact is certainly reinforced by Nada's ever-present video camera, several on-screen interviews, and basically the entire second half of the film, after the arrival of Hoffritz, when the lovers-in-New-York story is jettisoned for a sort of self-referential mash of partly developed ideas and quoted cinematic aphorisms. Revealing as this may be of certain pretensions amongst would-be hip filmmakers of the era, Blank Generation is too inconsistent to be assigned to any category. Still, the film is attached to a time and place which holds interest. Richard Hell's partly autobiographical character expresses an ennui closely related to that of Hell and The Voidoids as the film was being shot. The band members were just a couple of months removed from a troubled tour of the UK (backing The Clash), and had experienced a series of delays in the release of their first album. The hiatus caused by Hell's involvement in the film allowed drummer Mark Bell to accept a standing offer to join The Ramones. and The Voidoids were never to regain traction. Their one album remains a classic, however, and Hell himself retains credit for being a seminal figure in the New York underground, if not punk rock itself. A member at various times of The Neon Boys, Television, The Heartbreakers, and The Voidoids, Hell's compositions such as "Blank Generation" and "Love Comes in Spurts" were being performed on the CBGB stage as early as March 1974, and the simple aggression of his bass playing was a key influence on what was to become the punk rock sound. Malcolm McLaren, before returning to London to create the next big thing, took note of Hell's spiky hair and ripped t-shirts adorned with safety pins. This DVD features a surprisingly clean and bright print – a huge improvement over previous releases – which highlights the talent of cinematographer Ed Lachman. The compositions are full of internal frames and reflective surfaces; and numerous interior scenes are lit naturally even as huge windows reveal a background of bright perfectly exposed streets basking in the winter sun. New York's Lower East Side looks almost glorious as many locations showcase the neighborhood's late-'70s grunge décor. An obvious familiarity with CBGB allows for a few memorable set pieces, either of the Voidoids performing on stage or the graffiti-laden band rooms and equally clustered staircase leading down to the dreaded bathrooms. The extra feature is a 42-minute interview with Richard Hell conducted by fellow New York-based writer Luc Sante. Whether commenting on his place in the musician-turned-actor pantheon ("I do get some consolation that I'm not as bad as Bob Dylan"), or summing up the film's achievements ("there's actually not a single truthful authentic moment in the whole movie"), Hell is refreshingly candid and articulate with his bemused recollections of the shoot and the personages involved.